This is a mid-week post I figured I would do. I'll post about the previous post this Monday. So keep those replies coming in. Last night I was having trouble sleeping. I was up just kind of in a daze and decided to take a blast to the past. I decided to look up some of my old screen names and try to find some old blogs and sites that I have all over the web. It was really interesting what pulled up. 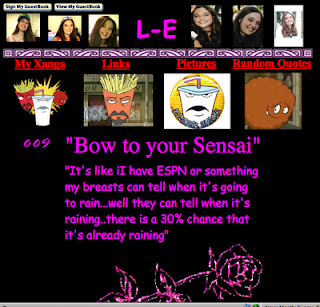 I had totally forgotten about my AOL blog. Not to mention the 30 geocities sites I created (That doesn't even count another account I had deleted). This is proof things on the Internet do not just disappear. It was cool to go back and read old posts. How I have evolved as a Blogger since the late 90's. Not to mention I have a better eye when it comes to web-design (Some of those geocities sites made me want to throw up they were so busy). Are you a Blogger? or maybe you were a Geocities site making machine? Are there pages on the Internet from your past that make you cringe?